Though the economy and housing market have begun to recover in the aftermath of the Great Recession, one unexpected impact still lingers. Landscape nurseries that saw fewer plant sales during the downturn are now battling weeds entrenched in unsold containers of perennials, shrubs and trees. MSMA is an old herbicide that was sold for both the professional market for postemergence broadleaf and some grasses control in turf. 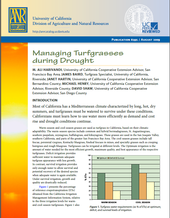 It was also available in the home use market primarily for crabgrass management. However, because one component of the herbicide is arsenic the use of MSMA has been greatly restricted, primarily due to groundwater concerns. It is currently only allowed for use in cotton and limited use on golf courses, sod farms and highway rights of way. – One broadcast application allowed on newly constructed courses.